It sounds like an easy enough cash grab, making a PG-13 Screen Gems horror picture about the Slender Man, the contemporary folktale told beside the modern-day campfire of the internet. But Slender Man actually has rough terrain to creep through; it could easily stumble into manic anti-technology paranoia (the message board ghosts are coming for the children!) or clueless attempts to tap into youthful horror trends several years after the actual youths have moved on (or, in the parlance of another meme: “How do you do, fellow kids?”). A movie about the Slender Man—a tall, spindly, faceless figure with optional spider appendages and an eerie power over children, officially created by Something Awful user “Victor Surge”—also now runs the risk of bad taste, given the real-life tragedy that accompanied the figure’s expanding mythology. 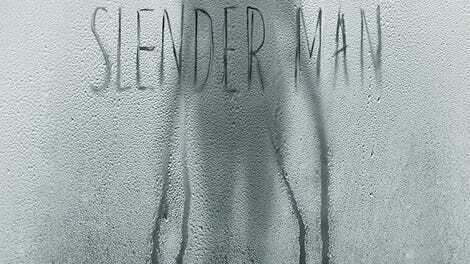 Ultimately, Slender Man, the major motion picture based on a message board post, does something far less memorable than bring shame or embarrassment upon its makers: It turns its boogeyman into a generic figure of menace who doesn’t feel ready for his moment in the horror movie spotlight. 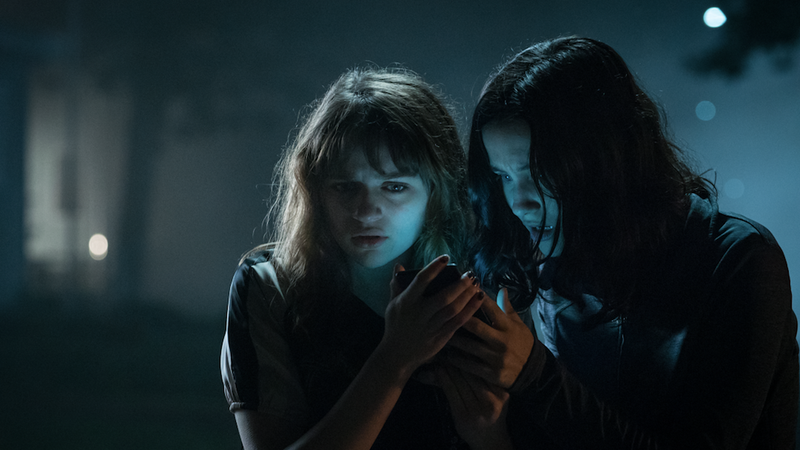 When teen besties Hallie (Julia Goldani Telles), Wren (Joey King), Chloe (Jaz Sinclair), and Katie (Annalise Basso) spend a listless Friday night doing some cursory research on the monster, it’s only because their dude friends haven’t invited them to a Slender Man summoning ceremony, and the crash course they give themselves (and the audience) is awfully vague. Regarding the figure’s alleged victims, one girl reports: “Some he haunts, some he drives mad, and some he takes.” Although she doesn’t add “and some he approaches with slow, stuttering movements like the girl from The Ring,” it’s still clear that this besuited creep is just a catchall for every boring movie specter of the past 15 years. There are moments scattered throughout Sylvain White’s film that hint at an influence beyond mid-’00s rip-offs of The Ring, especially in the too-brief opening moments. The four best friends have an easy chemistry, especially as they react to Wren’s lipstick-goth provocations, and White captures a dimmer, shabbier side of horror movie suburbia that sells the characters’ this-stupid-town ruefulness. When Wren asks her friends what age they’d like to stay forever (a question she nonsensically calls a “Twitter poll” as she asks it in person), Slender Man begins an It Follows-like thread about the impermanence and preciousness of youth, a sly way to justify a character who’s supposed to lure away children but instead focuses his attention on a group of near-adults. This thread hangs there for the rest of the running time. While their male counterparts chicken out, the girls accidentally summon the spirit (essentially just by closing their eyes and watching a montage of music video imagery), and once it’s clear that he is indeed haunting them, the movie draws an absolute blank on what kind of scary stuff should happen. Mostly, the characters skulk through the woods, tiptoe around houses, and occasionally tiptoe out of houses so that they can skulk through the woods. Crackling-branch sound effects abound, and all roads lead to the Slender Man. There are no real stalking-killer rules to be learned and exploited, which would be fine if the movie had big scares or a sustained mood. The best it can do is one effective scene where Hallie stumbles through a hospital hallway where everyone she passes looks unnervingly but not fully off-kilter. The filmmakers must have been understandably squeamish about anything that might resemble the real incident chronicled in the HBO documentary Beware The Slenderman. But in a movie this flat-out dull, even a tasteful lack of direct exploitation feels like a failure of nerve. In attempting to explain why the Slender Man is scary, the movie again brushes up against profundity: Maybe he’s scary because so many people are so fascinated by him? But Slender Man isn’t especially interested in the creation of a modern urban legend; it just wants to use some internet posts as corner-cutting, outsourcing the creepy drawings and sudden manifestations of so many movie hauntings. It winds up exposing the creature to more scrutiny than it can bear, at least in this movie. In the distance, yes, the Slender Man is an unsettling image. Up close, he’s just a man without a face.